After going up early, the Seattle Sounders conceded twice in the final 12 minutes to lose 2-1 to FC Dallas and put their playoff hopes in jeopardy. A disallowed goal from Herculez Gomez and a controversial free kick were difference-makers Sunday for the Seattle Sounders at Toyota Stadium in Frisco, TX, as they dropped a 2-1 result to FC Dallas after a late, world-class goal from substitute Carlos Ruiz. “We’re a tough team,” said interim head coach Brian Schmetzer. “I’m not concerned about the team ducking their heads, dropping their shoulders. It didn’t happen after the Portland match that we lost (4-2). It’s not going to happen after this match. We’re going to watch the film, figure out what went wrong in key moments, and then make sure that we’re ready for (Real Salt Lake). Coming in to the game, the playoff path was simple for the Sounders: Win and they were in the postseason. A loss meant their hopes to clinch before the final day of the regular season rested a Portland loss or draw. The Timbers won Sunday, making a Seattle win imperative Sunday, Oct. 23, in final regular season game against Real Salt Lake. Seattle (13-14-6, 45 points) used most of its first-choice roster, with left back Joevin Jones returned from international duty. Jordan Morris started at striker, and Nicolas Lodeiro playing underneath him. Alvaro Fernandez started on the left wing. 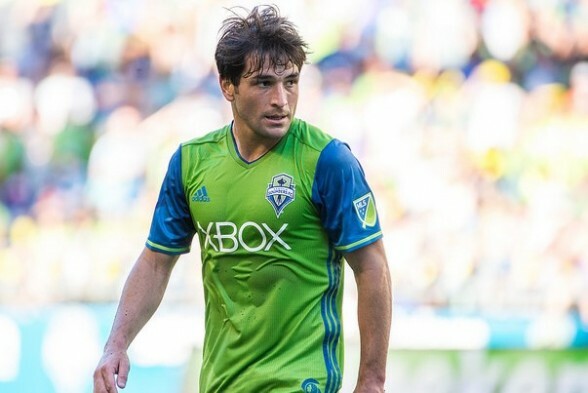 Brad Evans did not make the trip, still recovering from a calf strain, while designated player Nelson Valdez did not make the 18-man roster. Osvaldo Alonso served a one-game suspension for his red card against the Houston Dynamo Wednesday. Seattle nearly grabbed the lead in the 33rd minute, when a ball swung across the Dallas net and found the foot of Fernandez, bouncing straight up above the goal. Center back Roman Torres went up to contest the ball, as did Dallas keeper Chris Seitz. Both missed the ball, which was finished into the net by Herculez Gomez. But the referee decided the contact between Torres and Seitz was enough to warrant a foul, and the goal was disallowed. Two minutes later, and 2,600 miles away, Fanendo Adi converted a penalty kick for the Timbers past keeper Tim Howard of the Colorado Rapids for a 1-0 win. In the second half in Texas, Dallas poured on the pressure, trying to crack Seattle’s back line. In the 78th minute, Ryan Hollingshead went to the ground in the left alley after a light push in the back from Gomez. Dallas awarded a free kick, which was finished into the net by Maximiliano Urruti after a scrum in the penalty area. The dagger came in the 89th minute, when Ruiz ran onto the end of a chipped through ball and volleyed it over keeper Stefan Frei’s head to put the hosts on top. Frei nearly provided an equalizer in the sixth minute of stoppage time when he came forward for a set piece and almost headed the ball into the net, only to have his effort tipped over the bar by Seitz. The bid for the playoffs comes down to Sunday at 1 p.m. vs. RSL (1 p.m., JoeTV). If Seattle loses, they hope that on the same day, Portland (12-13-8, 44 points) does not win on the road, where it is 0-10-6 this season in Vancouver against the Vancouver Whitecaps. The Gomez goal should have counted, but since referees always call contact in the 6-yard box for the goalies, I didn’t get worked up over it. I wonder if saying the Sounders blew it would be too harsh. For most of the game Dallas had trouble picking apart Seattle’s defense, and when they did score I’m not sure how much of it was from a bad call, Seattle losing concentration, or just terrific shots. Anytime Geiger is officiating, one is sure to be Geigered. The defense collapsed when Marshall went out. Wish Frei scored on that header. Might have gotten an Espy if he did or at least a spot on plays of the night.